Prothrombin time was described by Quick in 1935. It is the time taken by re-calcified plasma to clot in the presence of tissue procoagulant extract known as thromboplastin. It asses the efficiency of the extrinsic coagulation system. The test depends on activation of factor X by factor VII by tissue factor. 1. Thromboplastin: Thromboplastin is a mixture of tissue procoagulants. Thromboplastins have different sources e.g. placenta, human brain, rabbit brain. Recombinant thromboplastins are available. 2. Calcium Chloride: 25mM calcium chloride. The details of the method are beyond the scope of this text. The outline is as follows. Thromboplastin is added to plasma that has been separated from blood collected in sodium citrate and allowed time to mix. To this mixture calcium chloride is added. The time taken for the plasma to clot is the prothrombin time. The end point (clotting) may be determined manually or using automated (optical or magnetic) methods. The results is reported as the number of seconds taken for the clot to form along with a normal value and as INR. Thromboplastin is a mixture of tissue procoagulants. The source of thromboplastin affects the test results. From the time Quick described the prothrombin time till the 1950s the cadaveric human brain was the source for thromboplastin. Each laboratory had to make it’s own thromboplastin. In the 1950s commercially available thromboplastins became available. These were derived from animal tissue. Contamination by serum resulted in the presence of some coagulation factors in the commercially available thromboplastin. Oral anticoagulants reduce the levels of vitamin K dependent factors (II, VII, IX, X) prolonging the prothrombin time in proportion to the decrease in the levels of coagulation factors. Use of thromboplastins contaminated with coagulation factors made the test less sensitive to the decrease in coagulation factors in the test plasma. An important clinical consequence of the insensitivity of prothrombin time performed with use of animal thromboplastin was increased risk of bleeding in patients on oral anticoagulant therapy. A survey of average warfarin dose showed that the average dose of warfarin was higher in North America where commercially manufactured thromboplastins were used compared to UK that used human thromboplastin. Anticoagulation monitored by human thromboplastin at PT ratio (Patient’s PT/Normal or control PT) of 1.5-2 was compared with anticoagulation monitored with animal thromboplastin and a target PT ratio of 2-2.5. The two were found to be equally effective. Also the patients monitored by PT preformed by using human thromboplastin had a 20% lower risk of bleeding. These observations suggested the need for standardization of prothrombin time to adjust for variations in the reagents used. The concept of international normalized ratio was introduced by WHO in 1983 to fulfil this need. Mean normal PT is the geometric mean of prothrombin time of plasmas collected from at least 20 normal individuals. The group should include members of both sexes. The ISI is the international sensitivity index of the thromboplastin that is calculated as a part of caliberating of thromboplastin by comparing the thromboplastin against a the WHO reference thrombopastin (Internationla Referenmce Preperation, IRP). INR depends of the prothrombin ratio and ISI. 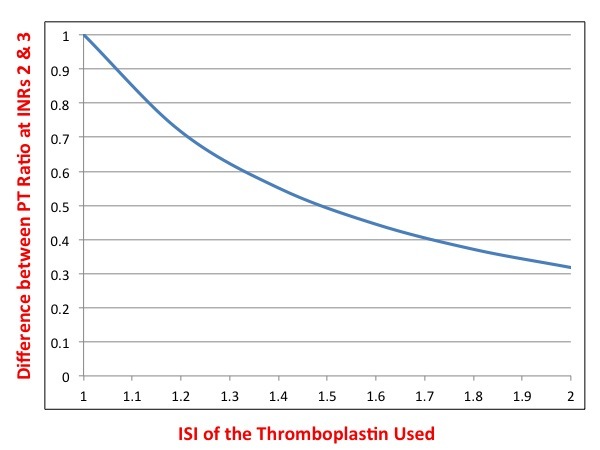 The difference between prothrombin ratios at INR 2 and 3 for thromboplastin with ISI between 1 and 2 are plotted in the graph above. The INR is maintained between 2 and 3 fro most indications. With a thromboplastin with an ISI of 1 the difference between prothrombin ratio at INR 2 and 3 is 1. This reduces to just over 0.3 for thromboplastin of ISI 2. Thromboplastins with a low ISI give a wider prothrombin time range for a given INR range allowing a more accurate control of anticoagulation. Higher ISI thromboplastins also give a less precise measurement of INR with a high coefficient of variation. It is recommended that the ISI of the thromboplastin used for prothrombin time should be < 1.7 (preferably between 0.9-1.2).